Go down the hill, 45 minutes gentle walk takes you to the Sable Antelope - male is black, female is brown colored breathtaking spectacular fall. Watch water splashing atop a cliff 30 meters high and the water forms a natural pool - this is a fitness exercise and its recommended for the physically fit people. Early morning Departure from Mombasa at 5.00am. 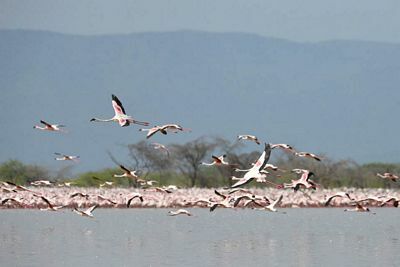 Drive along the main Mombasa- Nairobi Highway to the inland through semi-arid country to Tsavo East National Park, one of the world’s greatest wildlife sanctuaries, which is noted for its vast elephant herds ad variety of games including Buffalo, Giraffe, Zebra and plain game of almost every kind. You shortly visit Aruba, which is situated at the center of the park where concentration of wildlife and bird life can be viewed. Proceed to Voi Safari Lodge for lunch and have short rest before starting another extended game drive leaving Tsavo late in the afternoon, arriving in your hotel late in the evening.